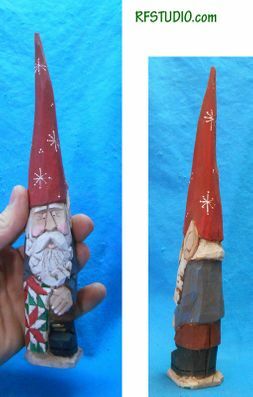 Christmas gnomes are sure to put a smile on any collectors face this holiday. Stanley is my whimsical house Gnome. He helps me keep the Christmas elves under control here in my art studio. Stanley was caught this year with a Christmas quilt. Measures: 1-1/2" x 1-1/4" x 11" h - from Basswood.